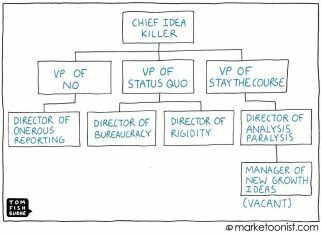 Marketoonist is the thought bubble of Tom Fishburne. Marketing cartoons, content marketing with a sense of humor, keynote speaking. Paid licensing options include high resolution download. 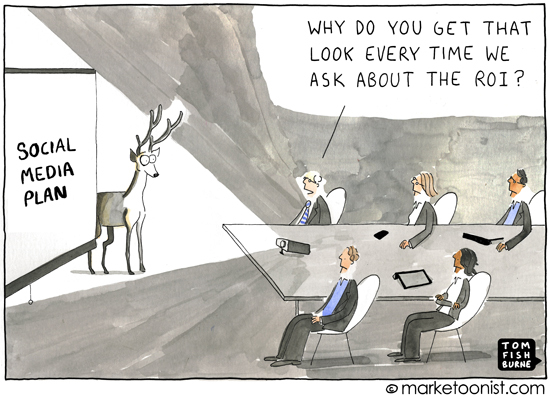 Few topics generate as many deer-in-headlights looks from marketers as social media ROI. It’s hard to know what to measure and it’s tricky to tie social media efforts directly to business results. A recent survey from the Chartered Institute of Marketers showed that very few marketers can measure the effectiveness of social media. Nearly a third describe social media as not at all effective. Some marketers challenge the very idea of measuring social media ROI as antiquated, similar to asking the ROI of having telephones in the office. Yet social media won’t be taken seriously by finance directors as long as the answer is to dodge the question. A good place to start thinking about the ROI of specific social media activities is Olivier Blanchard’s comprehensive book, Social Media ROI. Olivier follows a philosophy that “ROI is 100% media-agnostic” and shows how to draw conclusions from the social media metrics that are there. I’m interested to hear how you think about ROI for social media programs. Its a fascinating area which simultaneoulsy excites the agency but repeatedly gets the ‘exhale through closed teeth’ from clients. And exploring this within a global B2B context is even harder. It always comes back to this: As Eric Qualcomm once said (emphatically, and FIRST), what is the ROI of your mobile? You can’t measure, but you simply must have it. (And, by the way, what is the ROI of your mother… and everyone has that kind of pillar, too). At least on the last, we would all agree, the reward of a solid Mom is definitely there. Ditto a mobile, and Ditto emphatically, a social media platform, whichever and however it takes shape. The demand for Social Media ROI is frustrating. Don’t get me wrong, I understand it. Companies are spending money, and they want to know what they’re getting for it. In the end though, it has to be done. The consumer expects you to be where they are and be available to help them there. What you get back directly for it is less important than what you don’t lose by doing it, namely their business. SM is just one of those things; you know that you need to do it and try your best to do it right. The direct ROI is secondary… unless you don’t mind your consumers buying from someone else instead. Haha love this Tom! So many people clam up when they get asked about social media ROI. The fact is, if you haven’t thought about it from day one of your social media planning, implementation and management, you need to take a good look at yourself! People also get too bogged down in the way the SM is affecting the ‘bottom line’ – figures such as retention, reduction in customer service time via traditional routes and many many more variables should be taken in to account. 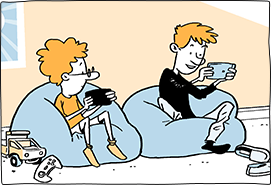 I think my favorite cartoon in the 6 mos or so that I have been receiving your weekly emails! I learned early in my career that you will fail strategically before you do financially … and, like anything else, social media needs to have a strategy behind it; if an effective strategy exists, ROI will follow. This is great and so true. Many businesses have yet to find a solid way to track ROI on their traditional marketing vehicles so it isn’t surprising that many struggle in the social arena. With new channels comes the need to develop new methods of evaluating ROI. Fully agree that you should decide what to measure ahead of time to ensure you’re investing in Social Media wisely, but if your management is balking at the idea of investing in social media, good luck getting them to invest in the tools to measure it. I have often found myself playing a game of “chicken or egg” with my management over investing in digital marketing. My management wants proof of ROI before they will increase the investment, but we need to increase the investment in order to measure and prove the ROI. This cartoon is hilarious! I agree with Mike. Social media should be treated like any marketing plan with specific goals laid out. I just came into a social media position. One of our goals was to become an expert within the online community related to our business. I have multiple ways to measure this and can show my boss concrete evidence of our growth in this area. Calls to action are also a great measuring tool. There’s nothing to be afraid of if you have a plan with goals! In my experience, clients seem to experience some kind of ‘strategic blindness’ when it comes to social media. Measuring ROI depends on having good objectives. Unfortunately, all too often ‘i need a facebook page’ seems to be the stragic imputus to engage. Of course it’s difficult to measure success if you don’t know why you’re doing it. In addition, clients tend to think of social media as a silo or an end in itself, when actually it should be part of the mix, an extension of brand experience. As Mike says, sometimes it’s just a case we’re fixated on measuring the wrong thing. A 10% increase in buzz is not necessarily good if it’s driven by price comparison or, worse, negative buzz. We need to look for more meaniful metrics as indicators of success – reach, advocacy, influence. And sometimes, the metric of success in social isn’t even in social media. So for customer service engagement lowering the overall time spent per interaction and therefore the cost per ‘call’ is the metric you should measure – not whether you have more buzz. Similarly, a community engagement success could be measured by increase in loyalty, not numbers of comments. I find using social media takes A LOT of time … tracking results or ROI? Even more. In this sense, Romney’s line is true that “corporations are people, my friends” … so to avoid inauthenticity, whatever you’re doing w/ social media, you should sincerely try to inform the conversation/offer something of value to readers …that way even if you can’t directly track ROI or SEO etc, you could at least argue it’s good PR, helps brand recognition and offers intangible benefits. Recently I realized LinkedIn had somehow accessed my personal email address book and is now suggesting people I hardly know who are on my kids’ school PTAs listservs. (That may be good for LinkedIn–and I did connect with some of them–but it startled me and strikes me as kind of creepy. And how does one “undo” it? One can’t. I was on a panel talking about this very subject this morning at the beginning of Social Media week in London. I really wish I had had this cartoon to share with the audience. It is so true! Your insight is very useful. Thanks for mentioning me in your post. I really dig the cartoon. Also, I can second your recommendation for people to read Blanchard’s book. It is indeed comprehensive and has a many good insights. I head up our social media services for small businesses at Deluxe Corp., and what’s interesting for me is that our clients ask about ROI from social media a lot less than my boss does. He’s expecting clients to press hard on whether spending money on social media is worth it. And yet most clients, at least in our small business market, seem to be in the “blind faith” phase. If they believe social media is worth doing, they’re willing to spend money on it regardless of whether they see immediate results. If they’re skeptical, no charts or dashboards seem to be able to convince them there IS ROI attached. I agree on the social media being the vehicle if the destination, ie buying of product happens else where. So the value of social media, say Facebook would be the click to the destination. E.g. Facebook page has a button “Buy now” that will lead to the ecommerce page of the company’s website. That click can provide the indication of sales. The click can be tracked if properly tagged so we can study the complete journey taken by the user – whether the user eventually click the buy now and confirm buttons. whole new world to us. we use it for everything – research, product development, media, etc. Tom, thanks for capturing so well — for the 10,000th time — a typical moment in most companies. We can’t ignore the question of social media ROI. Instead, we should break it down. The first part is: What’s your objective? Like any medium, it’s foolish to say it has an ROI overall. The value of the medium depends on the program you’re running. The ROI will change from program to program. The second part is: How much “I” are we talking about? The investment in social media might be far less than other media in a company’s overall marketing budget. That puts less pressure on the “R”. The discussion here implies that some companies rank “social” versus other media, like TV advertising or in-store promotion. Those analyses miss the point. Social Media is a way for companies to participate in word-of-mouth — said differently, it’s customer relations, the same thing as an inbound 800 number. Do we ever question the ROI of customer relations? Social Media perhaps should be compared on that basis versus any other. What’s the lost return on ignoring honest feedback and leaving some unhappy customers unanswered? Fantastic commentary this week. Many thanks! This week’s print goes to Steve Schildwachter and the nuances he frames around delineating ROI depending for specific programs. There is no ROI for social media as a whole. The question is ROI for each program. Even for customer relations, I would argue that marketers should have an idea of the effect of positive customer service on the business. It may be hard to measure specifically, but they can at least lay out their assumptions. It reminds me how Zappos has an award for the call center rep who stays on the phone the “longest” with a consumer. The winner is something like 7 hours. We might question the ROI of one 7-hour phone call. But the symbol of that on the rest of the organization helps make Zappos into the customer service poster child we all know. There’s definitely a return on that overall investment. Hard to measure, but we can be sure they had a hypothesis they had to present to their board to justify all of the customer service costs they absorb as a business. 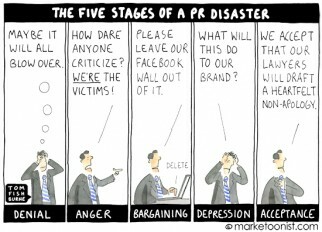 So true..It wasn’t that long ago when advertising channel ROI got the same response. It’s understandable that there is interplay between various channels and medium.. Like our Google ad helps the click-ability of our organic Google search result or that Ring Central’s Billboard off of 101 will have some impact on it’s San Francisco chronicle PR click through, but proper analytics can show a general relationship and deliver the ROI. To learn more, please visit us at http://www.Aryng.com. Social media is the new silver bullet for those marketers that don’t know how to get results. It’s unlikely that these marketers will generate a favorable ROI with social media if they cannot do so with traditional media. Social media is merely another tool whose productivity depends upon the skills of the marketer within the context of her product, consumer, the marketplace competitors and dynamics, among other factors. 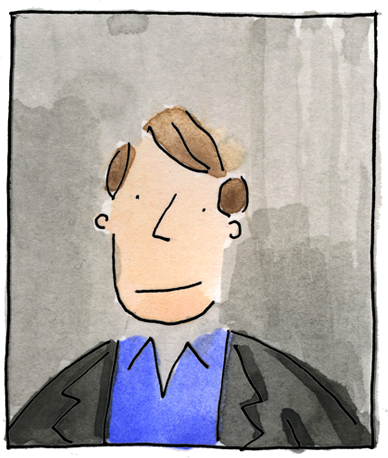 15 years of Marketoonist compiled for your marketing pleasure. Get a new marketoon delivered to your inbox each week. Content marketing with a sense of humor. Insightful, funny, and visual keynote talks and workshops. 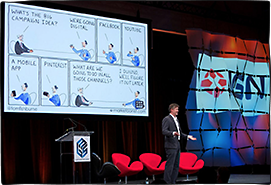 Tom Fishburne is the Founder and CEO of Marketoonist, a content marketing studio that helps businesses reach their audiences with cartoons.